The reviewer borrowed a copy of the book from her public library. Did you know that a black mamba snake can travel 24 feet in just one second? Each second four babies are born in the world, and a flea lays 100 eggs in an hour. 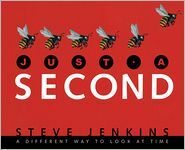 Readers will marvel at Steven Jenkins' newest nonfiction picture book which is full of fascinating facts related to time. The book is organized by units of time: one second, one minute, one hour, one day, one week, one month, and one year. Facts range from animal trivia to statistics on human consumption. "Around the world, 59,000 barrels of oil are used (almost all of them in the United States)." Using his signature torn and cut-paper collage, Jenkins illustrates each statistic; several facts and illustrations are arranged on colorful page. The vibrant colors and textured paper will appeal to young readers. A pictograph representing the history of the universe is located in the back along with a timeline showing the life span of plants and animals. Curious readers, especially kids who love world record books, will spend hours poring over the facts and illustrations in Just a Second. It's a fascinating read that will appeal to kids of all ages and may serve as a springboard to learning about the topics in-depth. It would also make a great book for an adult to share with a child and could lead to some rich discussions. Click here to see a book trailer for Just a Second.